One of the more interesting aspects of preserving and promoting a high craft is the nexus between tradition and innovation. 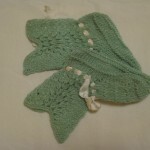 Knit and crochet is full of traditional patterns and techniques. They are often traditional because they look good, work well, and are pleasant to do. But crafts develop due to innovation. What happens when tradition meets innovation? In the spring of 2012, I took Susanna Hansson’s “Bohus Stickning” class. Susanna teaches not just the techniques but also the history of how this knitting collective provided economic relief in an area of Sweden adversely affected by economic changes. From 1939 to 1969, Bohus Stickning produced very high-end fine-gauge hand knit sweaters. Participants in the class received a kit to make the Blue Shimmer/Blå Skimmer cuff. One of my friends took the class, but decided working something at 8 or 9 stitches to the inch was not for her, so she gave me her kit. Bohus garments are worked in a specific yarn in specific colors in specific patterns with specific techniques. I decided to knit my kits up into a hat and gloves set, using commercial yarn for the plain areas. 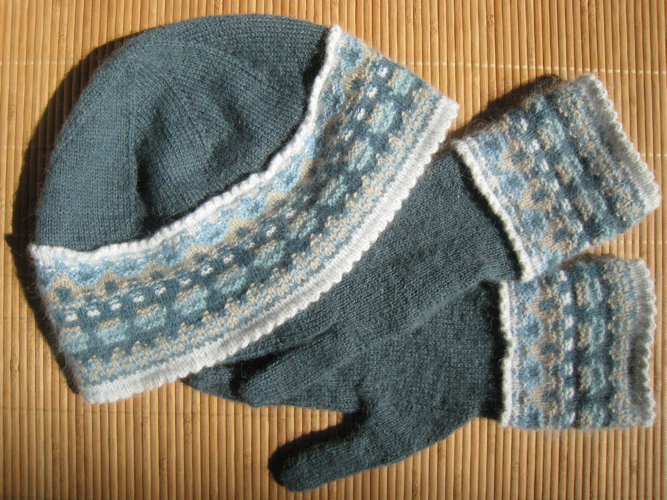 The Bohus patterns are on the cuffs and brim. I thought about how the goal is to create a couture garment. “How might the cross-polinization of knitting ideas have affected a 21st century Bohus knitter?” I wondered. After some thought, I decided a hemmed edge would be appropriate for a high-end knit. I used a picot cast-on and matching bind-off. 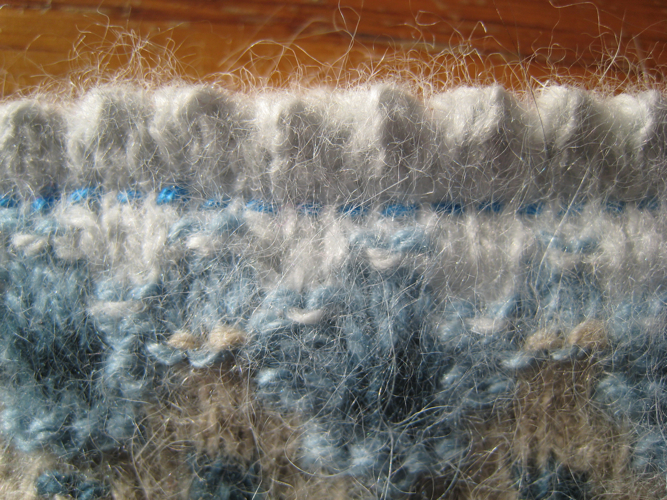 I also picked up stitches from inside the edge of the trim when I transitioned to the plain areas. I kept the plain areas sleek and clean, which is in keeping with Bohus aesthetic. Someone familiar with Bohus knitting would never mistake my work for authentic. Instead, I’ve combined tradition with innovation. 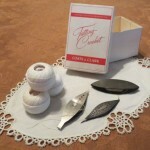 The completed set retains elements of the original aesthetic while also being of its own time.